Flushed with their success in proving when the Iliad was written, scientists have now proven that Herodotus’s Histories do not necessarily reflect universal practices and timeless truths. A pair of anthropologists recently compared Herodotus’s account of Egyptian embalming practices to some scholarly descriptions of and a handful of their own CT scans of surviving mummies. They found that Herodotus’s account, written sometime in the mid-fifth century BC, doesn’t to reflect mummification practices over the course of three millennia stretching from the Old Kingdom to the Roman period. They conclude, therefore, that Herodotus’s account of Egyptian practices was neither accurate nor adequately representative of what really happened. Classicists and historians everywhere are sleeping easier now that science has confirmed their centuries-old conclusions grounded in nothing more than historical analyses. In “Radiological Evaluation of the Evisceration Tradition in Ancient Egyptian Mummies” (behind Elsevier’s ubiquitous paywall, but the abstract should be free) A. D. Wade and A. J. Nelson offer what seem to be new findings about Egyptian mummies, such as which organs were removed, which were replaced into the body, and who was mummified and how. These findings, in turn, raise some interesting questions, some of which the authors tentatively answer. For example, the authors found that over nearly three millennia Egyptian embalmers commonly removed the same set of internal organs—lungs, liver, stomach, and intestines. They speculate that these organs were removed because their physiological functions would have been clear “even to the anatomically gifted but physiologically challenged knowledge of the Egyptian embalmer.” Although they do admit that this explanation doesn’t work so well for the liver. What I don’t understand is why the authors cast their work as a corrective to Herodotus. On the one hand, since antiquity scholars have questioned Herodotus’s veracity and accuracy and have pointed out his errors and lies. In his scathing critique, Of Herodotus’s Malice , Plutarch accused Herodotus of the worst kinds of deception: lies dressed up in elegant prose and engaging style that will attract readers. On the other hand, Herodotus was a traveler, a tourist, a collector of strange oddities. As Wade himself remarked to Live Science, many of Herodotus’s “accounts sound more like tourist stories.” Historians and Classicists have long considered Herodotus a collector and teller of stories. Yes, Cicero anointed him the “Father of History,” but his history did not conform to our modernist standards of factual veracity and accuracy. So then, who is responsible for creating Herodotus’s “normative descriptions … [that] impede the investigation of a wide range of variation in Egyptian mummification techniques” that bother Wade and Nelson? And what benefit is there in demonstrating that Herodotus’s report of embalming practices in the 5th century was neither accurate nor adequately representative of embalming practices centuries earlier or centuries later? Maybe Herodotus didn’t get it wrong. Maybe modern scientists got Herodotus wrong. After all, Herodotus couldn’t have been writing for 21st-century scientists, speaking to their intellectual concerns and interests in terms that they understand. So maybe modern anthropologists and scientists have misunderstood what Herodotus was doing when he wrote his Histories . They should not assume that they can treat Herodotus’s text as an unproblematic source out of which they can fish particular terms and then impose their meaning onto those terms. (86) There are men whose sole business this is and who have this special craft. When a dead body is brought to them, they show those who brought it wooden models of corpses, painted likenesses; the most perfect way of embalming belongs, they say, to One whose name it would be impious for me to mention in treating such a matter; the second way, which they show, is less perfect than the first, and cheaper; and the third is the least costly of all. Having shown these, they ask those who brought the body in which way they desire to have it prepared. Having agreed on a price, the bearers go away, and the workmen, left alone in their place, embalm the body. If they do this in the most perfect way, they first draw out part of the brain through the nostrils with an iron hook, and inject certain drugs into the rest. Then, making a cut near the flank with a sharp knife of Ethiopian stone, they take out all the intestines, and clean the belly, rinsing it with palm wine and bruised spices; they sew it up again after filling the belly with pure ground myrrh and casia and any other spices, except frankincense. After doing this, they conceal the body for seventy days, embalmed in saltpetre; no longer time is allowed for the embalming; and when the seventy days have passed, they wash the body and wrap the whole of it in bandages of fine linen cloth, anointed with gum, which the Egyptians mostly use instead of glue; then they give the dead man back to his friends. These make a hollow wooden figure like a man, in which they enclose the corpse, shut it up, and keep it safe in a coffin-chamber, placed erect against a wall. Families who paid for the most expensive method received an embalmed and wrapped body. Families that opted for the cheaper method or the cheapest method received correspondingly fewer services. Rather than remove the organs, the embalmers dissolved them using oils and then returned the bodies without wrapping them in any way. Herodotus leaves out a few useful and important pieces of information. He doesn’t tell us what happened to the unwrapped bodies after they were returned to the families. Perhaps the families wrapped them in linen, perhaps they didn’t. We can only guess. Herodotus also doesn’t tell us how many people opted for each of the methods, so we have no way of knowing what sort of distribution we should expect. Once again, we can only guess. He also doesn’t give us any idea about how long these methods had been used. And he couldn’t see the future, so he couldn’t tell us how long they would continue to be practiced. We can only guess. We should now be able to “formulate a hypothesis that can be empirically tested.” If the account by Herodotus is correct, then evisceration by abdominal incision should be found in some portion of Late Period mummies. Let’s turn now to the authors’ data and test this hypothesis. Table 1 selects out the Late Period mummies from Table 1 in the article. Examples of evisceration in Late Period Egyptian mummies. 24 of 25 mummies showed signs of evisceration. 18 of those were through an abdominal incision. Those numbers, 96% and 72% respectively, seem to agree pretty well with what we would expect if Herodotus’s story is accurate and adequately representative of 5th-century practices: some mummies show signs of abdominal incision and evisceration, some don’t. The hypothesis constructed from the stereotyped account by Herodotus is confirmed by the data. And if the data wasn’t sufficiently convincing, as further proof I offer The Historyteachers’ video Mummification. Despite framing the article as a correction to Herodotus, neither the authors nor the journal editors nor even the reviewers seem to have thought to consult a classicist or historian. Consequently, we get a rather simplistic straw-man argument that adds nothing to but overwhelms their real contributions about mummification practices. The authors and journal editors missed a chance to contribute to an interdisciplinary discussion about how we understand the past and how we can use scientific techniques to refine and extend our understanding of that past. The authors also refer to Diodorus Siculus, and both Plutarch and Porphyry receive a few mentions. But their main target seems to be Herodotus’s “normative descriptions”—excluding citations, they mention Herodotus 12 times, i.e., 41.3% of the total references to classical authors. By contrast, they mention Diodorus 7 times, or 24.1% of the references (Porphyry and Plutarch garner only 5 (17.2%) and 4 (13.8%) references each). First, the socio-economic status indicated needs further justification. The authors rely on B.J. Kemp’s distinction, which he developed in studying the Old and Middle Kingdoms and the Second Intermediate Period, roughly 1,100 years before Herodotus wrote. It would be nice to see the authors justify the applicability of these categories, which they treat as static and timeless. B.G. Trigger, B.J. Kemp, D. O’Connor, A.B. Lloyd (Eds. ), Ancient Egypt: A Social History (Cambridge University Press: Cambridge, 1983), pp. 71–182. 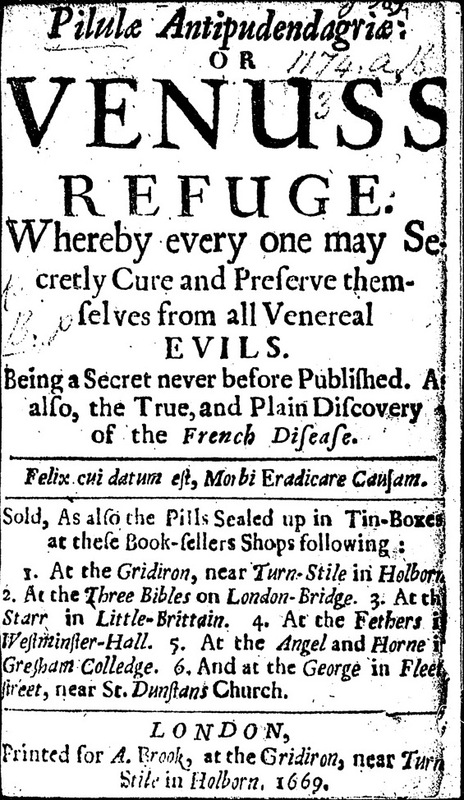 A little searching on EEBO suggests that “pilulae” (and variations such as “pilula” or “pilullae”) enjoyed a heyday of marketing authority for about 20 years in 17th-century England, right around the time people seemed particularly worried about the scurvy epidemic. Although the earliest reference to pilulae in the title appeared in Patrick Anderson’s Grana angelica hoc est Pilularum hujus nominis in signis utilitas Quibus etiam accesserunt alia quaedam paucula de durioris alvi incommodis propter materiae cognationem, ac vice supplementi in fine adjuncta, published in Edinburgh in 1635, the term did not catch on right away. The next pamphlet to refer to pilulae was published in 1664: Lionel Lockyer’s An advertisement, concerning those most excellent pills called pillulae radijs solis extractae. Being an universal medicine, especially in all chronical and difficult distempers, as by the ensuing discourse will most clearly appear . Over the next twenty years another 15 pamphlets by at least 8 different authors were published, each advertising some wonder pill that cured all manner of disease. The lists of places to purchase these pills offer a fascinating glimpse into the market for medicines in later 17th-century London. Booksellers seem to be the most common places to purchase these medicines. Coffeehouses seem to have sold medicines too. A few unexpected places apparently sold medicines: shoe makers, haberdashers, a cutler, and even a razor maker. These lists of places to purchase these pills could be used to map where things were sold. In some cases these pills were sold at a remarkable number of shops in London and beyond. The pamphlets seem to conform to a standard set of conventions. Typically, they include a discussion of the sources of the diseases, a list of likely symptoms, a suggested course of treatment to accompany the pills, and some testimony or report of the pills efficacy. They are all clearly marketing tools. It would be interesting to compile the diseases listed in these pamphlets to get an idea about what the public seemed to fear most in late 17th-century England. It would also be interesting to map where the pills were sold as well as begin to make a map of where different trades and shops did business. Perhaps there are other pamphlets that similarly indicate where certain items were sold that could be used to broaden the map of commerce in 17th-century London. Patrick Anderson, Grana angelica hoc est Pilularum hujus nominis in signis utilitas Quibus etiam accesserunt alia quaedam paucula de durioris alvi incommodis propter materiae cognationem, ac vice supplementi in fine adjuncta. (Edinburg, 1635). 40 pages. Lionel Lockyer, An advertisement, concerning those most excellent pills called pillulae radijs solis extractae. Being an universal medicine, especially in all chronical and difficult distempers, as by the ensuing discourse will most clearly appear. Truly and only prepared by Lionel Lockier, licensed physitian. (London, 1664). 16 pages. Cost: 4 shillings per box. Lionel Lockyer, An advertisement concerning those most excellent pills, called, pillvlae radijs solis extractae. Being an universal medicine, especially in all chronical and difficult distempers, as by the insuing discourse will most clearly appear. / Truly and onely prepared by Lionel Lockier, licensed physitian. (London, 1664). 16 pages. Lionel Lockyer, An advertisement, concerning those most excellent pills called pilulae radiis solis extractae. being an universal medicine, especially in all chronical and difficult distempers as by the ensuing discourse will most clearly appear. / Truly and only prepared by Lionel Lockyer, licensed physitian (London, 1667). 21 pages. Sold by Tho. Fydge, apothecary, at Bishopgate Street at the sign of the Sugarloaf. 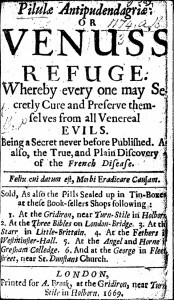 B.P., Pilulae antipudendagriae, or, Venus’s refuge whereby every one may secretly cure and preserve themselves from all venereal evils, being a secret never before published : also, the plain and true discovery of the French disease (London: A Brooks, 1669). 16 pages. at the George in Fleetstreet near St. Dunstan’s Church. Anthony Colly, Natures champion, sounding a challenge to her stoutest assailants: or, a more ample explanation of the virtue and use of my pilulae aureae purgantes, whose operation is hemetick, purgative, diaphoretick, diuretick, anodyne, and narcotick. Whereunto is added a plain and short method, whereby every one of an indifferent capacity … may know under what distemper they labour, and how … my pill works their cure and deliverance. : Also, catalogue of cures performed by this pill … likewise account of twenty four eminent cures performed by an eminent doctor … when all other medicines (except my pill) proved successless. (London: Richard Lownes, 1670). 40 pages. Cost: 5 shillings for 48 pills. Anthony Colly, A more full discovery of the use and vertue of those golden purging pills eminently helpful in the most inveterate diseases either in young or old; where other medicines prove ineffectual. Found by great study, costs, and pains, and now communicated for the publick good of all that stand in need of their balsamick vertue. Whereunto is added a plain, and short method, whereby every one of an indifferent capacity (by the signs and causes of most diseases of humane bodies) may know under what distemper they labor and how, and by what means my pill effects their relief. (London: Richard Lownes, 1671). 42 pages. Mr. Elmy, At the blew Ball in Heydon yard in the Little Minories, London, near the Tower, liveth one Mr. Elmy, operator, who prepareth that most excellent and successful arcana, Pilula Homogenea (London, [between 1673–1680]). 2 pages. Mr. Benjamin Harris at the Stationer’s Arms in the Piazza under the Royal Exchange in Cornhill. Cost: 3 shillings for 24 pills. R. Fletcher, Good tydings to the sick and lame: or, The sick-man’s library. Teaching both high and low, rich and poor, next under God, how to prescribe to, or procure ease for the pained, strength for the weak, health for the sick, and cure for sores. Being a true and candid relation of the vertue and uses of four excellent medicines, viz. Arcanum vegetabilium, Pilulae vegetantes, Balsamum vitae, Unguentum refrigerans, whereunto is added, a few of the many testimonies and cures performed by the same … published for the good of all who labour under pain and misery. (London: R. Fletcher, 1674). 16 pages. William Rayman at Bred Street near Cheapside, between Angel and Bell. M. Bromfield, A brief discovery of the true causes, symptoms and effects, of that most reigning disease, the scurvy. Together with the causes, symptoms, and effects of several other dangerous diseases. : Whereunto is added, a short account of those incomparable and most highly approved pills, called pilulae in omnes morbos: or, pills against all diseases (London, 1675). 16 pages. Cost: 6 shillings for 80 pills. Lionel Lockyer, An advertisement concerning those most excellent pills, called pilulae radiis solis extractae: being an universal medicin, especially in all chronical and difficult distempers as by the ensuing discourse will most clearly appear. / Truly and only prepared by me Lionel Lockyer (London, 1676). 2 pages. M. Bromfield, A brief discovery of the true causes, symptoms and effects, of that most reigning disease, the scurvy. Together with the causes, symptoms, and effects of several other dangerous diseases. : Whereunto is added, a short account of those incomparable and most highly approved pills, called pilulae in omnes morbos: or, pills against all diseases (London, 1678). 16 pages. M. Bromfield, A brief discovery of the chief causes, signs, and effects of that most reigning disease, the scurvy together with the causes, symptoms, & effects, of several other dangerous diseases most usually afflicting mankind. Whereunto is added, a short account of those imcomparable, and most highly approved pills; called pilulae in omnes morbos: or, pills against all diseases. Being the only famous medicine of this age against the scurvy, and most other curable distempers. Prepared and set forth for the publick benefit, by M. Bromfield (London, 1679). 16 pages. M. Bromfield, A brief account of some wonderful cures, lately performed by that well known and most highly approved medicine, called pilulae in omnes morbos, or pills against all diseases. Together with a most useful discovery of the chief signs of the scurvey (London, 1679). 2 pages. Anon., Pilulae Antiscorbuticae. Pills against that epidemic disease the scurvy, with all its symptoms (London, 1680). 2 pages. Anon., Pilulae Londinenses. or, the London pills, directed and prepared by a physician of many years standing in the College of Physicians in London, according to true rules of art, good for prevention, as well as the cure of all diseases, wherein purging is proper. (London, [1680?]). 2 pages. M. Bromfield, A brief discovery of the chief causes, signs and effects of that most reigning disease the scurvy together with the causes, symptoms, & effects of several other dangerous diseases most usually afflicting mankind. : Whereunto is added, a short account of those incomparable, and highly approved pills, called pilulae in omnes morbos : or, pills against all diseases (London, 1685). 16 pages. J.T., In the upper Moor fields, at the Globe and two Balls, liveth J.T. practitioner in astrology, and licensed physitian, who prepareth that successful pill, called Pilula Imperialis vel Sospitalis (London, 1700). 2 pages. Unfortunately, as David Nutt’s recent comments indicate, journalists, audiences, and scientists themselves too readily assume that universal authority and knowledge inhere science. Expertise in a specific technical scientific domain is readily equated with expertise in general. Knowledge in one domain, however, does not in itself demostrate knowledge in another. The Catholic Church did not ban Copernicus’s De revolutionibus . When Copernicus’s book was placed on the Index, it was expressly a temporary measure until the offending passages about heliocentricity being a fact were modified to mark it as a hypothesis. Placing Copernicus’s book on the Index wasn’t particularly effective—offending passages were usually modified so that they could still be read and the Index had little power beyond Italy. Go read Thony’s whole post and then go read Owen Gingerich’s An Annotated Census of An Annotated Census of Copernicus’ De Revolutionibus (it’s expensive, so borrow a copy from somewhere). First, at the most basic level, it is factually incorrect (see point #1 above). If scholars want to step outside their areas of expertise and make claims in other domains, they have an obligation to be accurate—or at least to try to be accurate. Sure, this requires some work, especially when scholars venture beyond their area of expertise, but accuracy is the least we should demand of people purporting to be authorities. Scientists of various sorts regularly and rightly lambast non-scientists for making ludicrous claims about science. Scientists, in turn, should be careful when the tread beyond their domains of expertise lest they make ludicrous claims. Second, Nutt’s assertion is ambiguous and misleading. His implication that the Catholic Church spoke as a single voice to condemn a book is not supported by history. There were many institutions that censored or tried to censor books: the Index was most closely tied to the Papal States and some Italian states that chose to adopt it. In the Holy Roman Empire, the Jesuits established their own mechanisms for censoring books. But the Jesuit efforts met with limited success as most of the territorial princes had their own systems. French officials compiled their own list of prohibited books and largely ignored the Index. Even in Spain the Index of Prohibited Books differed from the Index Rome. Whatever the merits of his argument about the effects of making certain drugs illegal, when David Nutt ventured into history he was wrong and misleading. His knowledge about neuropsychopharmacology, psychopharamcology, neuroscience, drug research, or drug policy did not translate into knowledge about the past. Expertise is not fungible. UPDATE: See Alice Bell’s excellent piece. And now now (according to Google) hundreds of other sites.